I specifically hadn’t planned to bake much in the near future, knowing that soon there would be a new baby in the house. But this baby is taking their time, so I’ve found myself with a fair bit of spare time. So, on Pancake Day, I was hunting through a Hallelujah! Easter recipe book to remind myself of the amounts needed for pancake ingredients. As I flicked through the book, I realised that a lot of the recipes were pretty simple and used ingredients we already had lying around the house. So I figured it was a good book to use to make relatively easy, simple-to-find-ingredients-for-recipes until this late baby made an appearance. The first thing I made was the Trinity Cake. I have made this before, but it was a couple of years ago. It’s actually a super-easy cake to make, but made a bit more complex by the fact that each layer is flavoured slightly differently. So there is a vanilla sponge layer, a chocolate sponge layer and a coffee sponge layer. Each layer is sandwiched together with buttercream, and then the top is simply dusted with icing sugar. The only time-consuming element is mixing together 3 different sponge cakes instead of one. One thing worth mentioning is that the recipe suggests using three 7in round sandwich tins. I used three 6in square sandwich tins – simply because that’s the type of tin I had three of, and I couldn’t be bothered to cook each layer in the oven separately. It turns out that this was the right choice; there was only just enough mixture to cover the bottom of my 6in square tins. It turned out fine, but if you did want to use 7in tins you should probably make more mixture than the recipe suggests (which is 50g of each basic sponge ingredient plus one egg). For a quick and easy weekend cake, it’s fine – but it’s not very exciting. 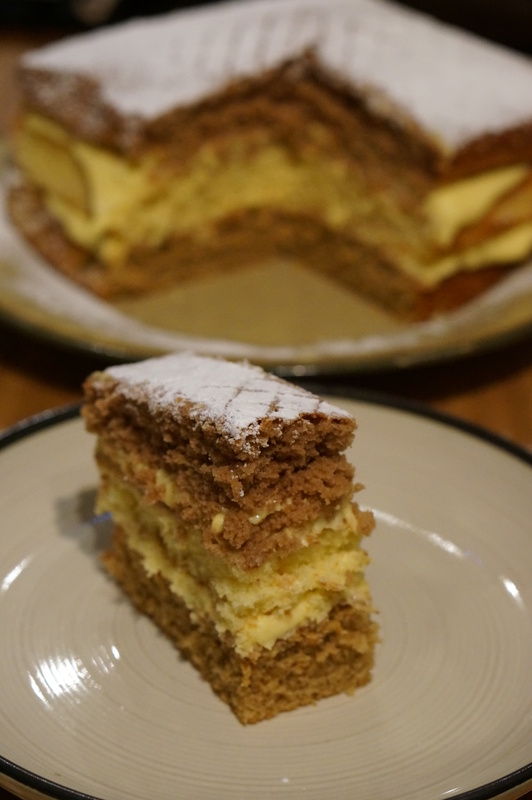 The flavourings are pretty mellow (although I guess it would be easy to add extra coffee or chocolate for a stronger taste), and it is, when you think about it, just a basic sponge cake. I’m not sure it’s something I would choose to make for a special occasion like Easter though (unless you really are a novice baker). I’ve made these before, but not for a couple of years. The cakes themselves are easy to make – they’re just basic fairy cakes. I made them a little larger than normal this year (cupcake size instead of fairy cake size), simply because I wanted to use pretty cake cases, and it’s increasingly difficult to get fairy cake cases that aren’t just plain white. The difficult part of these cakes is in the icing. Firstly, you cut out a cone shape from the inside of the cake (at the top) and add butter-cream. That’s not too bad – it’s a bit of a faff, but makes it taste pretty good. But then you make icing and spread that over the top of the cake (once you’ve replaced the cone). Then you roll stars out of fondant icing and place them on the top of the cake. Finally, you add sprinkles of some kind (the recipe suggests using dessicated coconut, which does look pretty good. But this year I used sugar sprinkles because I have loads, and in the past I’ve just used icing sugar). I’m not sure I’ll bother making these much in the future. They taste nice, but they don’t look amazing for the amount of effort you put in. The stars also have a tendency of falling down, especially if you don’t eat them straight away. Only really worth the effort if you don’t have a lot else to do – which wasn’t really true this Christmas! I haven’t done a lot of baking over the past month or so – a combination of heading off on holiday, there being too many other things happening, and there already being too much naughty food in the house – meaning we’d get extra fat if I baked too much! Therefore I’ve basically stuck to the recipes in my Homebaking 2014 calendar, just to make sure that I make each of the months recipes before I forget they exist! 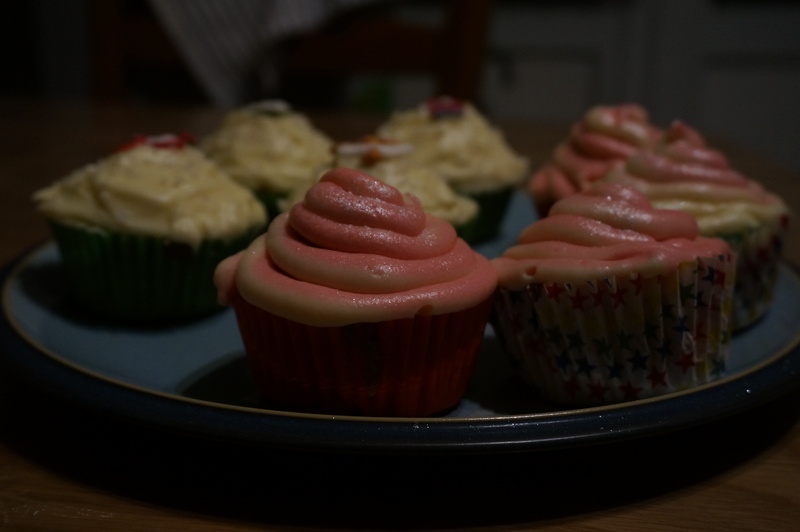 So, back in May, just before my mum’s birthday, and a visit to Exeter to see family, I made these cupcakes with rose icing. I knew plenty of them would get eaten by our parents, so wasn’t worried about the getting fat issue with these! The cupcakes themselves are pretty interesting – they’re fairy cakes, but you add white chocolate and strawberry yoghurt flakes (well, the recipe calls for “fruit flakes”, but to my mind that means yoghurt flakes. It worked out well, anyway). The icing is the fun part though. The recipe states that you just make pink buttercream (by adding some red food colouring and rose water), dollop it on the cake and decorate with sugar roses. The picture in the calendar looked much more impressive than that, so I decided that I was at least going to pipe the icing on the cake before adding sugar roses. And I think I did a fairly good job. You can judge for yourself by looking at the picture, but I’m fairly proud of these. They both looked and tasted good – and nobody complained when I handed them over to be eaten! Unlike the last two bakes, these were something of a last-minute bake to feed 14 or so people at our May Day weekend barbeque. I chose basic vanilla fairy cakes because I (almost) always have those ingredients in the house, and they’re quick to make. I chose spotty fairy cakes because all our kids have managed to catch chicken pox in the last month or so (some of them still have it), so a spotty theme seemed somehow appropriate. Once again, Dan did the baking here. Just as I was about to start, a very clingy toddler appeared and only wanted mum, so dad decided to try his hand at the baking – especially as we only had a couple of hours to get these cakes made before people started arriving. 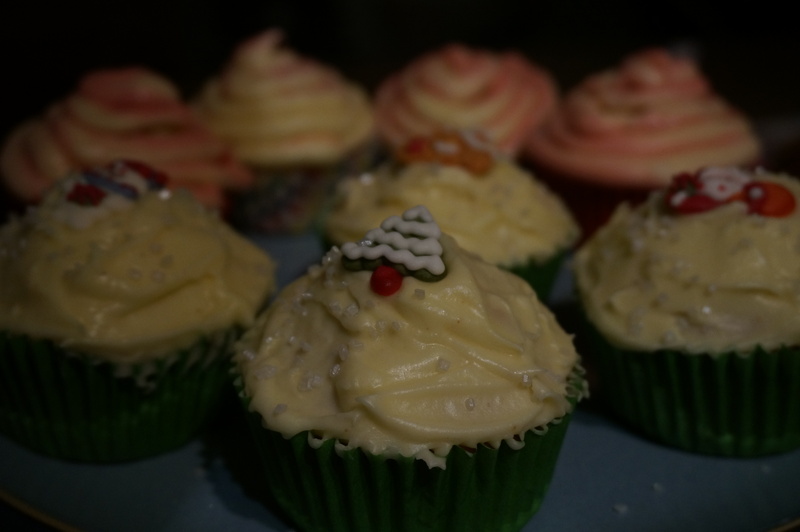 And he did a fine job, albeit one which used a few too many cupcake cases (and he moans at me for the occasional double cupcake case…). And once again, I did the decorating – which was pretty easy and quite fun. To decorate these cakes, I made a basic butter-cream which formed a layer to stick the ready-to-roll icing on to. I then cut out 6 blue circles and 6 white circles to fit onto the tops of the fairy cakes. To make the spots, I rolled 4 or 5 tiny dots of the opposite coloured ready-to-roll icing and placed them on the circles I had cut out. I then re-rolled the circles with the dots on top, and this created spots. It didn’t look too bad either – not something I had tried before, and a neat little trick for the future! Something else that I planned to make over the Easter weekend (funnily enough, what with them being called Easter nests and all), and that got put on the back burner due to all the other activities and baking happening at the time. Instead, they got made over the May Day Bank Holiday weekend for two reasons – because I still had a supply of mini eggs and flakes to use up, and because I wanted fast and easy cakes to make for an impromptu barbeque we decided to have. 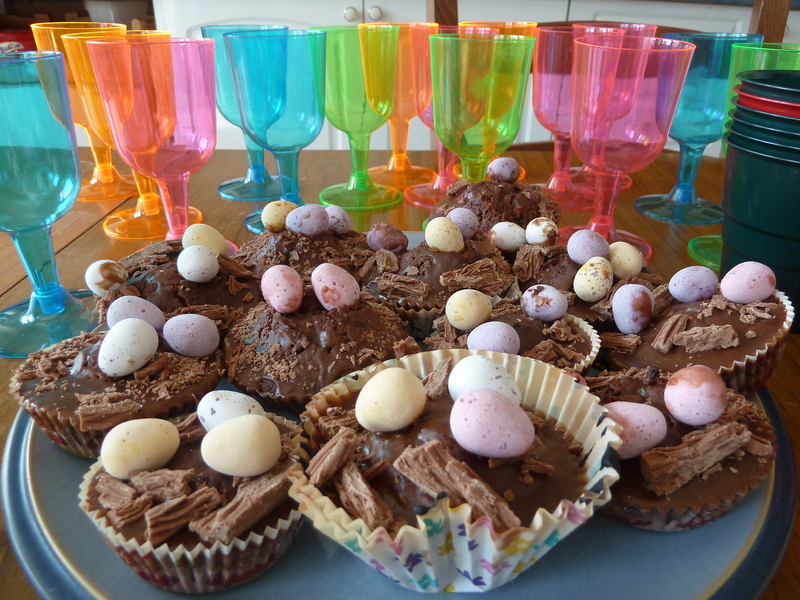 Easter nests are actually just chocolate fairy cakes, coated in either a chocolate butter-cream or chocolate fudge frosting, and topped with chopped up flakes and mini eggs. They look pretty good, taste amazing and are (for the most part) dead easy to make. So easy to make, in fact, that Dan did the actual baking on this one. I just did the decoration. I say ‘just’, but I did choose to make a chocolate fudge frosting, which is a little harder than a chocolate butter-cream. But it tastes much richer and, in my opinion, better! 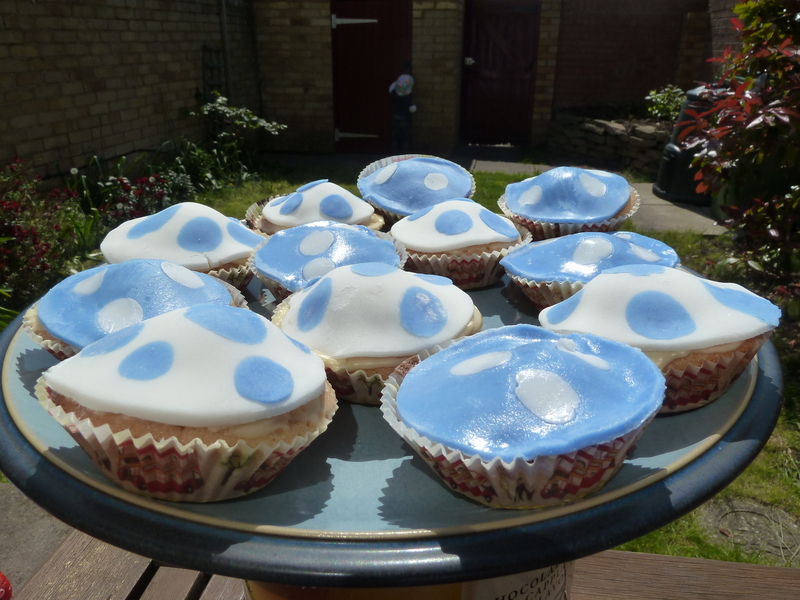 The next thing I made was some fairy feather cakes, ready for when my parents visited towards the end of the weekend. I made them on Saturday morning just before some friends arrived – but the decorating happened when they were here, and took somewhat longer than anticipated. 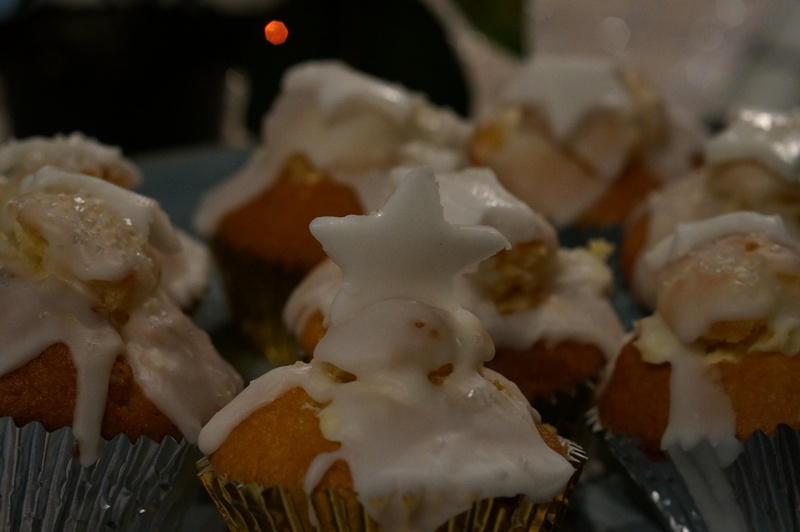 The fairy cakes themselves were easy to make – just simple orange flavoured fairy cakes. I don’t make orange ones often, but I make fairy cakes all the time so that was no problem. The challenge here was the decoration. It involves covering each cake in jam, then a layer of buttercream (again, both things I do quite regularly). 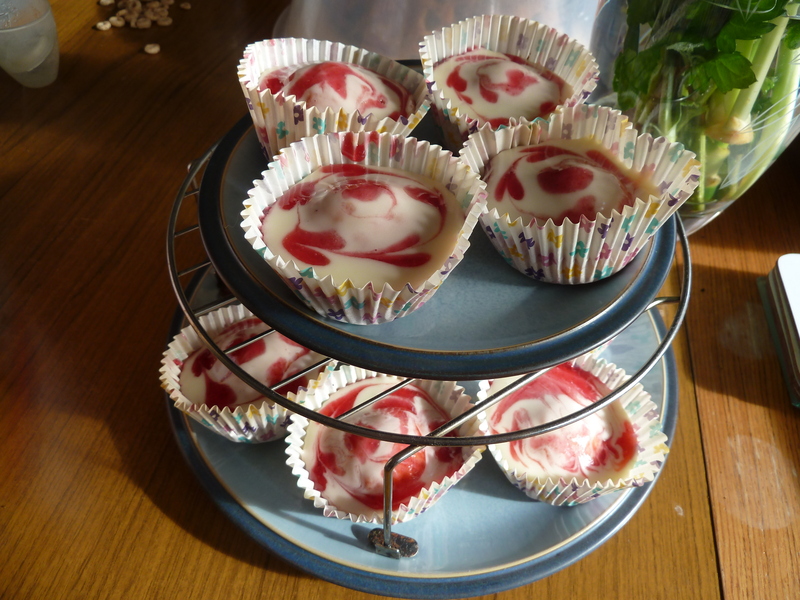 You then pipe circles of jam onto the still-wet buttercream, and use a toothpick to almost join the circles up. I wanted to try this because I had been bought a new piping set for Christmas (the kind where you throw the bag away after use, rather than the horrible plastic type). I admit that it was much, much easier to use than my old plastic tube, and I’d be willing to try a similar process in the future. It takes some time investment though! The fairy cakes themselves tasted fine, but they were rather sweet. I suspect there were two reasons for this – I used orange juice to make the buttercream, and I think it would have tasted better if I had used just water. Also, I used redcurrant jam instead of strawberry or raspberry (as the recipe suggested), simply because this was what I had in the house. Raspberry would probably have worked a lot better.